In this blog post, I will explain how to play around with different types of encodings using C#. 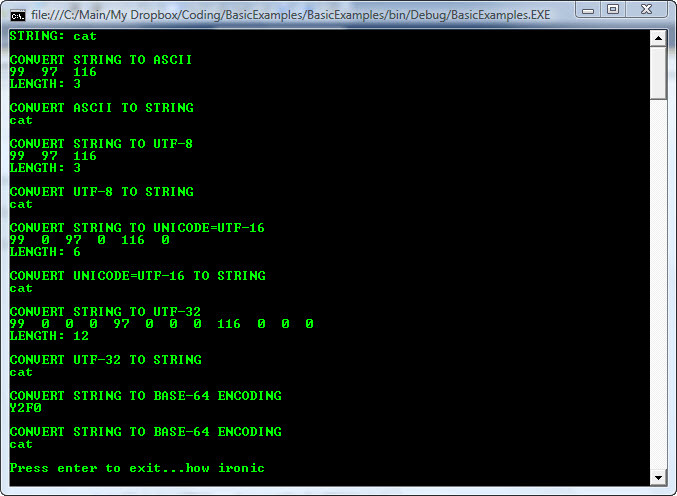 I will mainly concentrate on ASCII, UTF-8 and UTF-16. Character encoding systems consists of a code that pairs each character from a given set into something else, such as numbers. ASCII - works on general english characters. For example, in ASCII capital 'A' is represented by decimal 65 and small 'a' by 97. UNICODE - works on a broader set of characters. Its a more consistent encoding to represent text expressed by most of the world's writing systems. Unicode is not an encoding. Its a standard. It can be implemented by different character encodings. Most famous being UTF-8 and UTF-16. UTF stands for Unicode Transformation Format. UTF-8 uses 1 byte at a minimum while UTF-16 uses 2 hence UTF-8 files are generally smaller in size than UTF-16 files. UTF-8 is backward compatible with ASCII while UTF-16 is not. Both UTF-8 and UTF-16 are variable-length encodings. That is, its not guaranteed that UTF-8 will always use 1 byte and UTF-16 will always 2 bytes. UTF-16 can use 1 byte or 2 bytes. UTF-32 is fixed-length encoding. All characters representations take up 4 bytes of space. The advantage of this is that byte arrays are easily indexable. That is, you know that the second character in the array will always start with the 4th byte that is barray. Because every character takes 4 bytes, UTF-32 is space inefficient. Let's take a string "cat". Convert it back to numbers and then to string: "Y2F0"
In this case, ASCII can not represent this character hence the results for ASCII, UTF-8 and Base-64 encoding are wrong since they are actually for string "? ".